Working with Ogilvy New York, Current Studios created an immersive experience to teach children home safety. As the marquee of Nationwide Insurance’s #MakeSafeHappen 2015 campaign, an 18-wheeler truck trailer was retrofitted to look like the interior of a home, touring the U.S. and stopping at events to entertain and educate kids. Although the interior of the truck looked like a home, it was loaded with the latest in smart technology to create a true blend between the physical and digital world. Current built furnishings in the truck with animatronics so that it would physically react to a child's interaction. Televisions would alarmingly shake, medicine cabinets would deliver cautious messages - each room would respond as children explored. At the outset of the experience, kids were handed Nationwide branded iPads, where they were introduced to Nate, The Nationwide Safety Eagle. This illustrated and animated mobile experience, designed and produced by Current, guides kids through all five rooms within the truck. Using over a dozen BLE beacons, each child was connected to rooms within the truck and the elements in the room. Their iPad would know their position, what they were interacting with, and then would respond, either digitally (on the iPad) or physically (in the truck). In the end, this experience was an insurance industry first for the use of smart technology and children's education. CoverGirl and StarWars recently collaborated on a line of limited edition makeup for the highly anticipated film; “Star Wars Episode 7, the Force Awakens”. They chose New York Fashion Week as the platform to reveal 7 exclusive looks created by legendary makeup artist Pat McGrath at a high-profile event attended by fashion writers and bloggers. Current Studios was approached by Grey NY to create an interactive installation at the event designed to show off these stunning new looks in an innovative way. With the theme of the event being the choice between the dark and light sides of the Force, we wanted to give attendees the power of the Force to help explore this exclusive line of CoverGirl products. With only two weeks to design the digital experience, create the 3D models of the new product line, and assemble the custom hardware, once again we leaned on our agile creative and development process to work with Grey and CoverGirl to achieve the futuristic results they were hoping for. The resulting effort included two custom built digital displays. Semi-transparent acrylic screens created the illusion of holographic models floating in space with an asteroid field of makeup products floating around them. When an event guest raised their hand, they harnessed the power of the Force, and unlocked the ability to explore the colors and styles for each of these exclusive new products with the wave of a hand. The event created a lot of buzz online, through a range of media outlets. Images and video content popped up all over social media using the hashtag #BeautyForce. The surprise guest appearance of Janelle Monae helped to raise the profile of the product line as they revealed her exclusive look – Resistance Pilot. The interactive installations were a hit with curious guests, adding an innovative element to the product launch and creating memorable interface with this limited edition line of makeup that have Star Wars fans clambering to get their hands on. When Bloomingdale's partnered with the NBA for the 2015 All-Star game, they installed a street length of basketball-inspired shop windows at their New York City flagship store on 59th & Lexington. Six weeks before launch, NBA Entertainment engaged Current to develop an interactive experience for fans on the high-street. Current developed Get†In†The†Game†, a Kinect-powered free-throw. Launched on 19 January, in the lead up to the All Star Weekend in Brooklyn, the game drew an average 600+ daily interactions. the NBA shop-in-shop was the perfect opportunity to unite fashion and basketball as we celebrate the NBA All-Star Game's return to the city," said Lisa Piken Koper, NBA vice president of licensing. Our friends at Sparks + Honey engaged us at a moment's notice to build a mobile site as an access gate to free wifi at Northside Festival in Williamsburg, NY. The goal was to find PepsiCo's next Cultural Curator with a series of pop culture questions framed around jobs of the future. Users with enough correct answers won an interview for the gig. In addition to build a visually engaging site, we pulled together network service providers to set up wifi hotspots at various Northside venues. And it all came together in 3 crazy days. Current worked with the brilliant creative minds at Arc Worldwide in Chicago to develop the Mars Escape Augmented Reality game as part of the Intel Experience, available exclusively at Best Buy stores. From concept to execution, the project was touched by several teams within Current. The design and modeling team started by creating a replica of a Mars landscape to act as the surface on which to play the game. Key to this was a representation of the terrain found on the red planet with crevices, craters and peaks. With the CAD files complete, the mould and manufacturing of the mountain was cast and completed by Small Creations in Dallas, TX. Meanwhile, understanding the shape and layout of the physical terrain, the Current game development team were able to recreate this environment within Unity, manipulating the Rovers to react to each dip and curve on the landscape for a seamless blend of physical to digital. The app uses the latest in edge-detection and extended tracking computer vision, allowing the Rover to understand and interact dynamically with each crevice of the rugged terrain. In tandem with this early development phase, the Current animation team were full steam on designing the 3 Rovers, each with their own features and strengths - Speed, Mobility and Power. The theme of the game creates a sense of impending urgency. With an asteroid collision heading for Mars, the goal is to collect power pods to help launch your Rover off the red planet inside 60 seconds. "The clock is ticking. Can you escape Mars before it's too late?" Current Studios has released Super Heroes Assemble, in partnership with Marvel and Walmart, to promote the release of The Avengers: Age of Ultron, in theatres May 2015. The Super Heroes Assemble app is packed with an enormous range of Avengers content, combining retail-based augmented reality activations with immersive virtual reality 360° animations, as well as an exclusive interactive comic game, written and designed by Marvel. Building on previous successful retail-driven apps, the Super Heroes Assemble app is a hub for all the latest Age of Ultron behind-the-scenes content, character art, sound bytes, character profiles and fun Avengers dress-up features. Users are inspired to visit Walmart to scan Doritos, Dr Pepper, Hasbro, Kellogg’s signage and product packaging strategically positioned around stores to unlock additional content. The call to action also drives traffic to scan images at a micro-site on walmart.com/avengers as well as online video streaming site vudu.com . The promotion of the Super Heroes Assemble app was also boosted by an Current Studios-produced 30 sec commercial, advertising the exciting app content which ran in theatres across the US as well as online. Current partnered with SDI Marketing to produce an AR-powered app for the Rogers Connected Zone at sports events across Canada. Launched at the 2015 Rogers Cup, the app was expanded to join the Rogers team on the road to Hometown Hockey, Kraft Hockeyville events as well as featured at home games for the Toronto Blue Jays, Toronto Maple Leafs, Vancouver Canucks and Edmonton Oilers. Rogers-branded floor decals are scanned to bring athletes and celebrities to life for a unique photo opportunity. Some athletes are even custom scanned in 3D by Current Studios. Thousands of photos from the events have been shared online, drawing attention to the interactive Rogers Connected Zone. Working with an international New York agency, Current developed a virtual reality experience that helps the user understand the daily challenges of living with a life-long disease. The narrative encourages compassion, empathy and delivers a strong message. The user begins the day in a kitchen and is exposed to the confusion of the injection process, the dietary restrictions, and the shame in deciding where to store medication. As the user explores the homes-setting via their VR headset, the daily challenges of relationships, lifestyle, financial and career obstacles become clear. The fully immersive virtual reality experience uses a Google Cardboard viewer for iPhone 6, offering realism of 360° photos and CG enhancements. Ray-casting allows hands-free activations of interactive hotspots spread around the rooms by staring at points of interest. Candid Catmera is the purrrfect solution to all your cat-related selfie problems. Developed by Current Studios. Ideal for those days spent in the office or away from home. Now your cat can take its own photos, and upload them to social media. Using advanced whisker analyzation, paired with eye, ear and tail segmentation, Candid Catmera attracts your cat with unique animations and SFX, and determines if your feline friend is ready for a photo. You'll receive a Notification to your phone of the latest selfie before sharing the image on social media. The CN Tower is looking to take both youths and adults for a walk on the edge with a new OOH campaign for its EdgeWalk experience. With media by Toronto-based BT/A Advertising and creative by Astral Out-Of-Home and Current, the campaign relies primarily on transit shelter ads in Toronto and employs the IRIS Augmented Reality App (created last year by Astral and Current Labs). 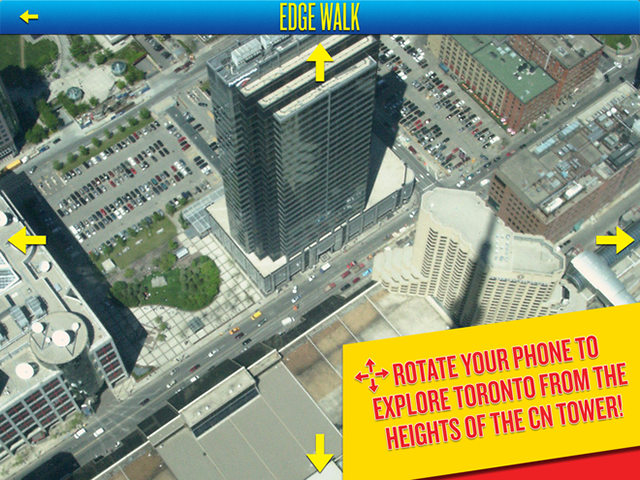 When the ads are scanned with the app (compatible with both iPhone and Android), a 360-degree view from the top of the CN Tower is projected, allowing consumers to get a feel for what the EdgeWalk experience is like. Consumers can then snap pictures of the views they see on the interface, and share them with friends via email or social media. The CN Tower ads will also appear on a billboard in Yonge-Dundas Square. Postcards will be handed out at the Tower that can be scanned to trigger the AR experience. Lisa Tompkins, director, marketing and communications, CN Tower, tells MiC that it was important for the CN Tower to continue to drive excitement both around the EdgeWalk and the Tower itself as a tourist attraction. She says an OOH campaign was the most accessible way for the CN Tower to bring the EdgeWalk to life, allowing consumers to interact with and experience it.